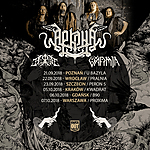 radogost Helroth Varmia veil of maya Knock Out Productions helroth vive la fete varmia knock out productions Arkona a2 metal obsidian mantra netherfell. kwadrat knock out productions. Tup, tup, tup. Idą zmiany.